Looking forward into 2019, part 2. 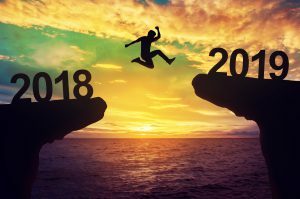 A man jump between 2018 and 2019 years. Written by Polly Simons for C&I. This is part two of two. You can read part one here. Nowhere is this more important than for petrol retailers, who have seen the number of forecourts across the UK and Ireland drop by more than a third in the last four years. “It’s a very good opportunity for them and retailers have taken it with both hands,” said Brian Madderson, chairman of the Petrol Retailers Association. At Parkfoot Garage in West Malling in Kent, you can pick up meat and fresh bread from its in-store bakery and butchery counters. Other retailers sell theatre tickets and fresh juices. “So many independent stores have tried working with the big retailers and it hasn’t worked, so they’re doing their own thing,” he said. Technology has already changed the retail experience beyond recognition and it’s continuing to revolutionise everything from in-store navigation to payment processes. Last month, retail giant Sainsbury’s opened its first checkout-less store in South London, with customers scanning goods via their iPhone and paying for them through ApplePay and the Sainsbury’s SmartShop app. For independent stores, the Ubamarket app is making waves, plugging in to the store’s existing operating system to allow customers to create a shopping list, navigate the store and pay for goods via their phone. “Tesco can afford to make their own app, but this isn’t the case for smaller stores, and that’s where Ubamarket comes in,” Scott Annan explained. “It’s Amazon technology but not costing £10 million and by the end of next year, it will be pretty universal.” Whether you opt to go completely checkout-free or still include a few human operators, there are other advantages too. With fewer checkout assistants needed, employees can be retrained for foodservice or the retailer can take the saving. “It’s win-win for everyone,” Annan said. The days of wilted lettuce and frozen ready meals are over. When it comes to c-stores, customers expect product quality and freshness similar to the big supermarkets, but with the feeling of shopping at a neighbourhood store. “Whether they have some narrative about how they are produced or are served in environments that are reflective of the food, people are looking for foods that showcase authenticity,” said Davinder Jheeta. At Simply Fresh, that means fruit and vegetables are as local as possible, and ideally supplied to the store within a couple of days of harvest. The group also prides itself on championing British produce and local, small-scale producers, many of which aren’t stocked anywhere else. Products, particularly fruit and vegetables, are tasted regularly and older items marked down, while bread and meat are prepared daily at the in-store bakery and butcher. “Convenience needs to offer elevated standards of fresh food, but also add a charm and service that customers can buy into,” he said. With the convenience and low prices of online and discount retailers making it difficult for independent retailers to compete for the ambient product market, savvy retailers are increasingly realizing the importance of curating their ranges of household and laundry goods. “Ambient sales account for around 10 per cent of sales, yet for too many retailers, especially symbol groups, they give that 10 per cent of sales 70 per cent of space,” said Scott Annan. Think health isn’t an issue for your customers? Think again. Recent statistics from HIM show that shoppers are crying out for healthy options – but don’t believe their local store will stock them. But offering healthy alternatives isn’t as simple as ordering in some gluten-free snacks. Every expert agreed that what is considered “healthy” differs according to location, and knowing what health and wellbeing means for your customers and stocking accordingly is the key to success. “We know that health means different things to different people, so it’s not just calorie counting or eating fruit and vegetables, but it can also be portion control or protein packed or maybe dietary specific,” said Davinder Jheeta. At Simply Fresh’s University of Surrey store for example, a wide range of main meal food-to-options make it easy for students to eat properly round the clock, while low fat and low-sugar snacks dominate the till queues. Not surprisingly, the store recently picked up the Innovation Award at the 2018 Convenience Retail Awards. “When we can add the accessibility of products that people want, when they need it – the essence of convenience stores – that’s when we can start to promote wellbeing,” he said. Scott Annan and members of the Independent Retailer Owners Forum will be visiting Sydney and Singapore in March 2019. See aacs.org.au for details of any events.